The FLEX PE14-2-150 Marine 31 Boat Oxidation Removal Kit is designed for the boater that demands the best for their boat. By combing the lean, mean, oxidation-removal machine known as the FLEX PE14-2-150 with what is arguably the best boat compound and best boat wax available, we�ve created an all-inclusive kit that will restore the gloss and color to your boat. The kit also includes the necessary pads and everything else you need to make your boat shine like new. Marine 31�s Twisted Wool Cutting Pad is available in a 7.5 inch diameter, perfect for a 6 inch hook & loop backing plate. This pad will restore dull, oxidized paint with your rotary polisher. This is an ideal pad for detailers who prefer a smaller pad size and are experienced with using a wool pad. 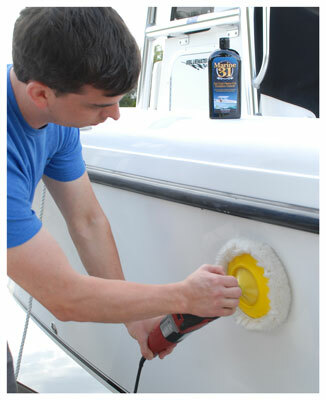 Use the Twisted Wool Cutting Pad with Marine 31 Gel Coat Heavy-Cut Oxidation Cleaner on heavy scratches and scuff marks. A total retail value of $586.87. You save $86.88!